Ok, I've been waiting and waiting for the office to be finished before posting it on here... and then I realized that it just ain't happening any time in the very near future. So I wanted to at least share my glorious desk hackery. Why glorious? Because for the first time ever, we not only have enough desk space, but we have a desk that isn't made out of IKEA particleboard! It's, um, made out of IKEA butcher block instead. The combo? A 96 inch butcher block, a Vika Alex drawer thing that used to hold up my old craft table, and six Vika Moliden legs = the perfect desk. I was worried about weight distribution because the butcher block weighs about 200 pounds, so I was originally going to use eight legs to hold it up. But that was super duper aesthetically displeasing, and I was psyched to remember that we still had that white drawer unit. So I put four legs in the back, two in the front, and anchored the front more with the drawers. The butcher block comes raw, since it's intended for kitchen use, so I sealed it with four or five layers of water-based poly. Also, all the cables and modems and surge protectors and things are hanging off the underside of the tabletop in the back, dangling from screw hooks, which keeps them off the floor and makes them nearly invisible from most vantage points in the room. Next on the office-decor to do list is actually hanging all the pictures instead of just resting them on random surfaces in the room, and getting some kind of cover or something for the futon which will remain the guest bed for the foreseeable future. So, any camouflaging-that-old-futon tips anyone want to share? Looks good! Thinking of doing the same thing myself. Which variety of Numarar wood is this? How long is the table top? Casey, the table is 96" long. Actually, I think it might be closer to 97", but IKEA marks this as the 96" length. Anonymous, this is the oak Numerar, $169. Do you know if Ikea had longer lengths? Their site only shows up to 77" i believe. I'm looking for 108" for the same purpose, but plan on cleating the sides and back so i don't have to use as many legs. Yours looks great! Thanks for sharing...it looks amazing! Is that the oak countertop? On the website it says that the width is only about 26 inches...is that enough space? Please let us know...thanks again! This is great! 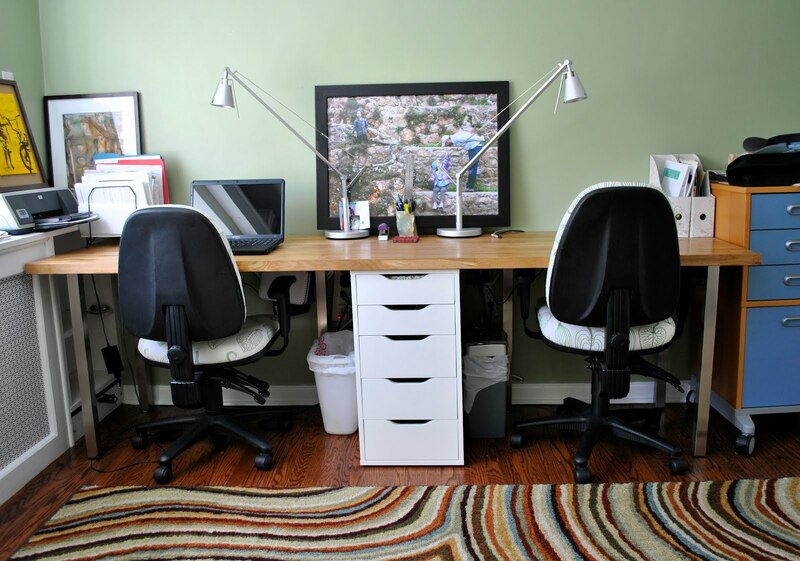 My husband and I are looking for a double desk, but we're not finding any that we're really happy with, so I think this option is going to the top of our list :) How did you attach the legs to the butcher block? A great idea for a home office. Thanks for sharing what you got through posting it here. My wife and I are going to make the same desk. Do you really need the two middle legs if you use the "Alex Drawer?" It's the exact same height of the legs with "rubber feet." Wouldn't that work as middle support? Legs are 27.5" and the Alex is 27.5" high. Just a thought for people on a tight budget. Anna, what poly did you use and where did you buy it? Did you sand the butcher block before the first coat? I just used Mixwax's Polycrylic, which doesn't have the yellow cast of their polyurethane (which can sometimes be nice for a golden-ish glow on the wood, depending on what you're going for). I did lightly sand the butcher block with 220 grit sand paper, just to get it to be extra smooth. I also sand in between the coats of poly. So how well is this holding up?